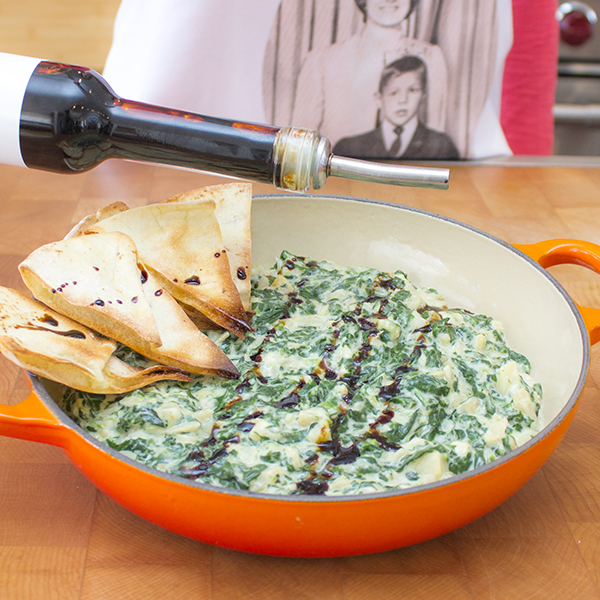 For those who love to entertain by serving a variation of appetizers, this dip recipe will satisfy the host in you. 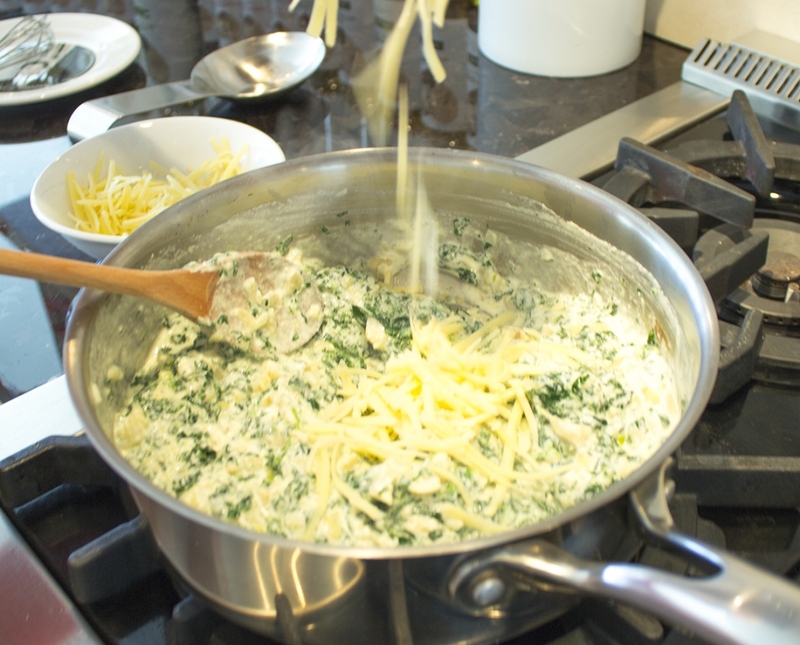 Made of Gruyere, Cheddar cheese and Mascarpone, which gives a creamy texture to the preparation. 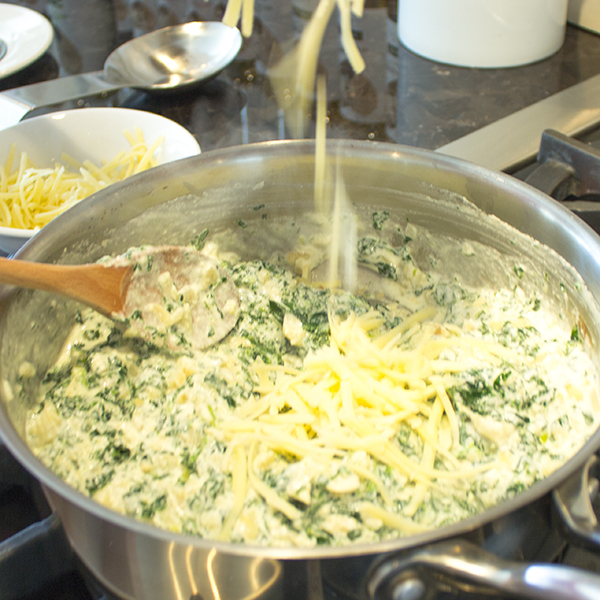 Then, for the color and a healthy touch, Julie added spinach and artichokes. For those who love to experiment, you can replace those two ingredients by sautéed leeks or arugula, cauliflower, tomatoes or any other vegetables that comes to your mind, fantasy is all yours. 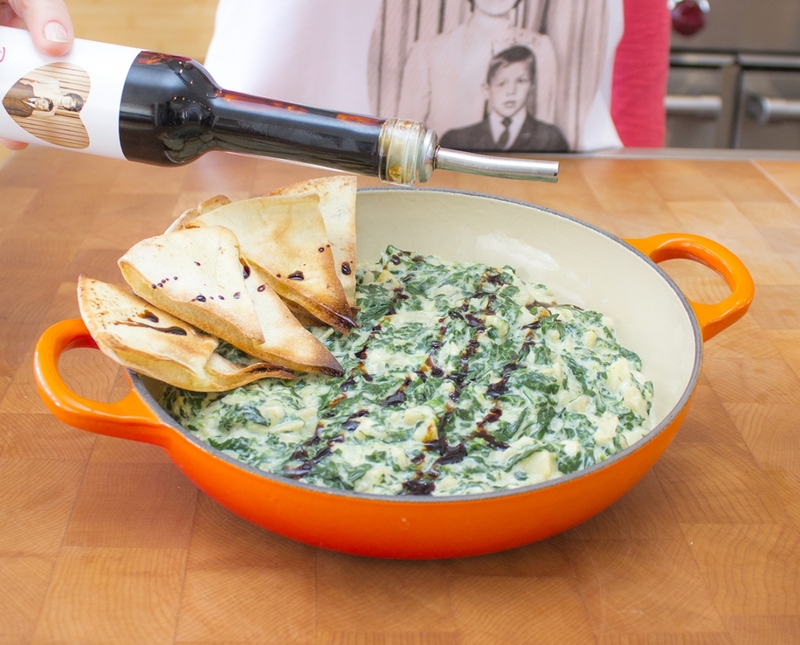 Julie serves this hot dip with crispy pita bread but you can also serve it with nachos or raw vegetables. 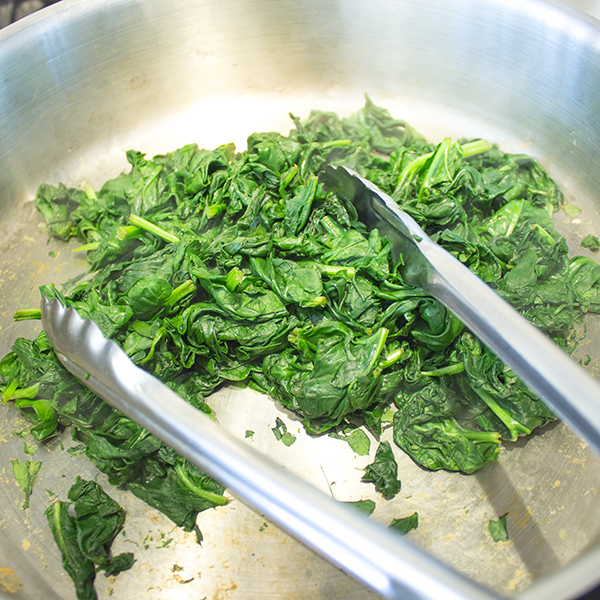 Clean spinach nad place in a big pan over medium heat. 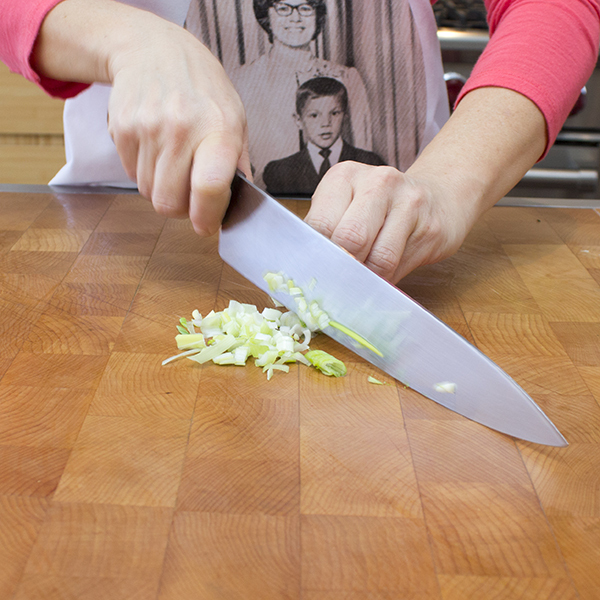 Cook until wilted. 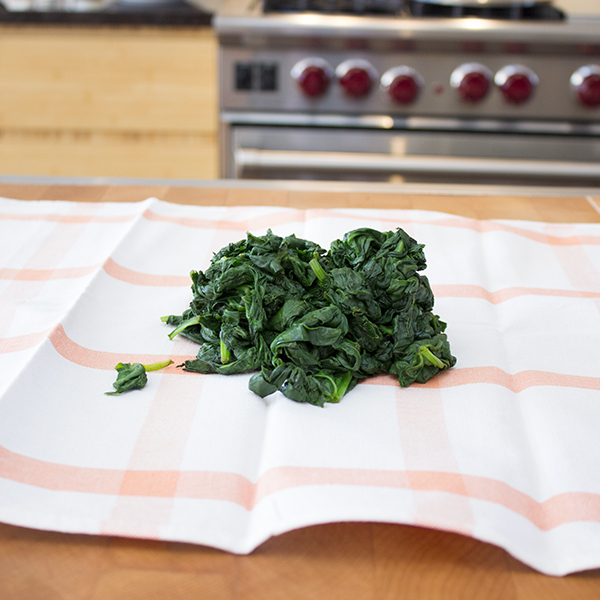 Place spinach in the center of a clean cloth. 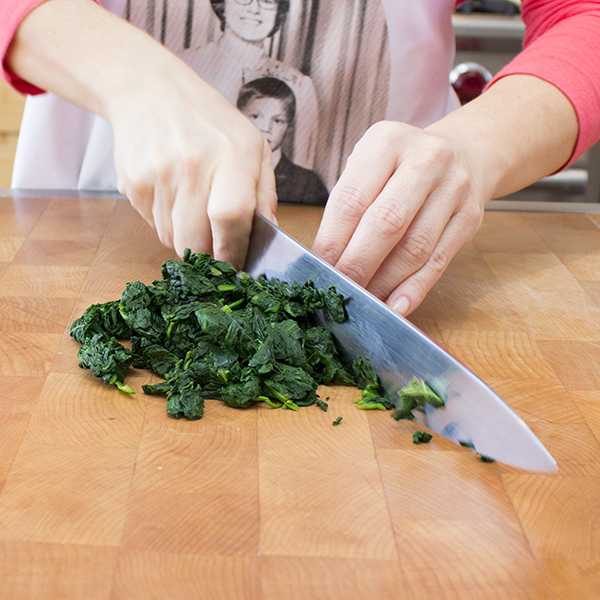 Fold sides of cloth, turn and squeeze over a bowl to remove excess of water from spinach, mince spinach and set aside. Mince Draind artichokes, shallot and garlic. 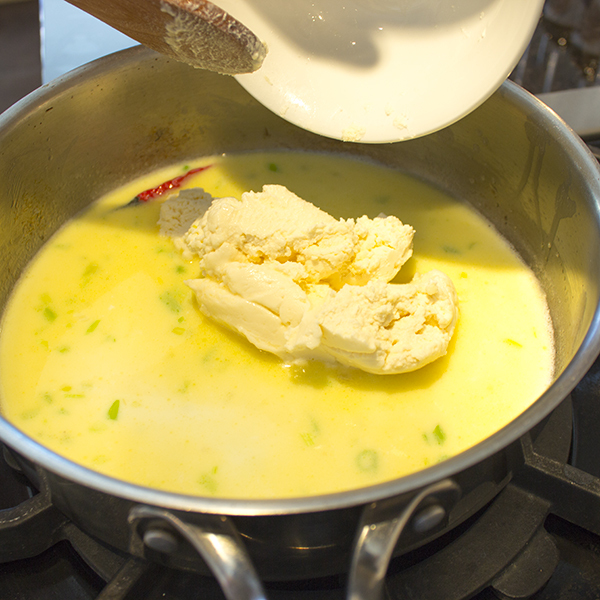 Melt butter in a medium saucepan over medium heat. 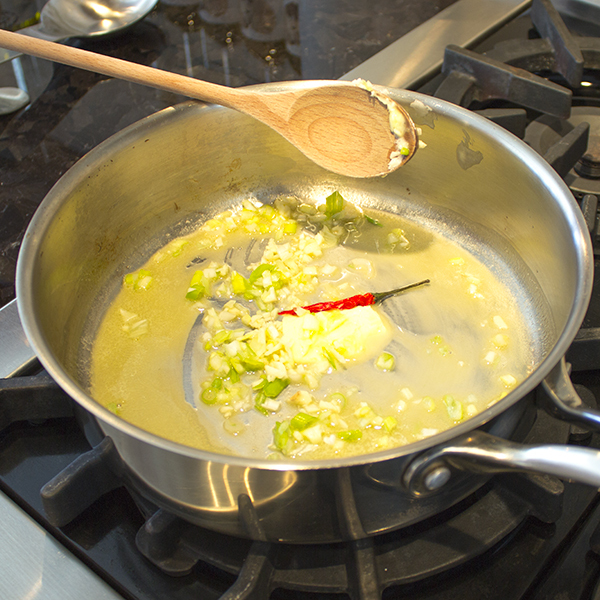 Once it foams, add the shallot, red hot chilli pepper and garlic. Cook until softened, about 2 minutes. 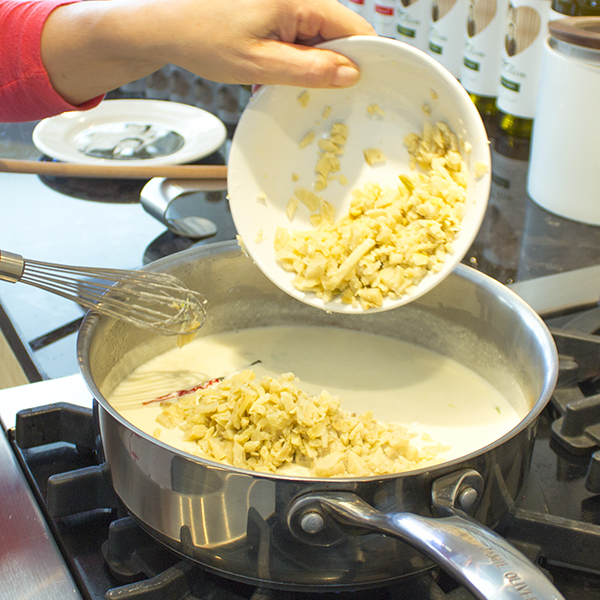 Slowly stir in the milk and mix, stir in mascarpone cheese and mix until completely melted. Add artichokes, spinach and combine. Add cheddar and gruyère cheese and simmer over low heat until completely melted, about 5 minutes. 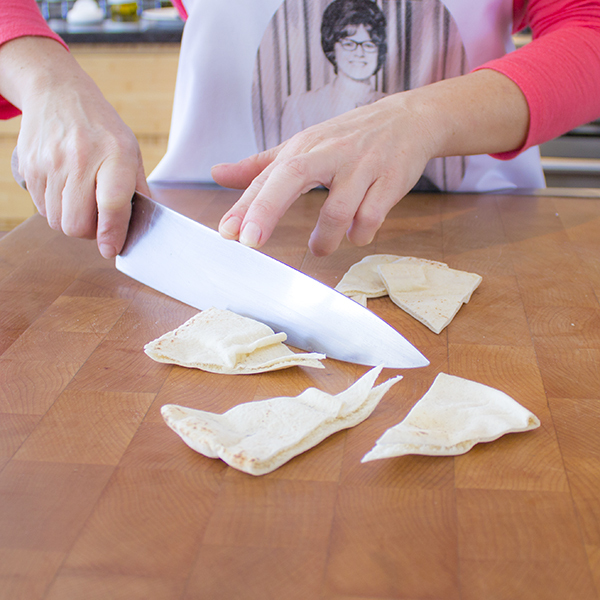 Meanwhile (optionnal), preheat oven to broil and cut your pita bread in small triangles. Place pita in oven in an oven plate, cook on both sides until golden brown. 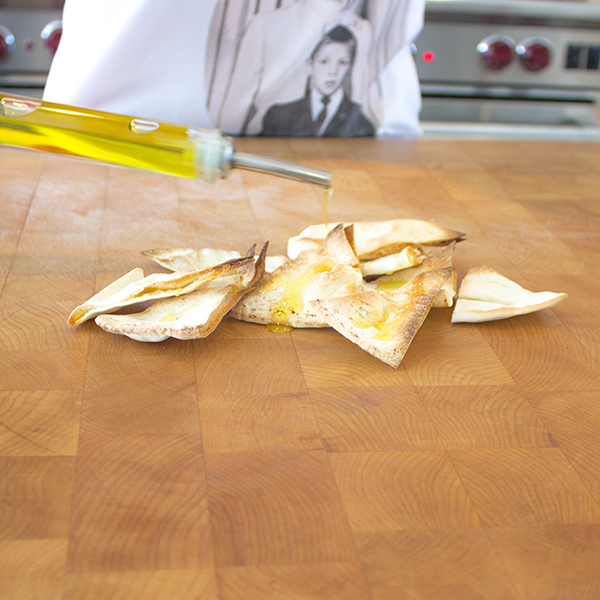 Take pita out of oven and drizzle with olive oil, salt and pepper to tast, set aside. 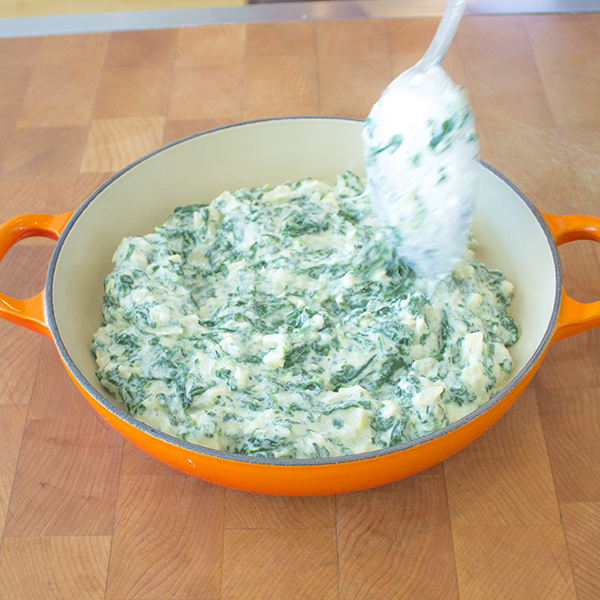 When ready, transfer dip in a serving bowl. Serve with warm and crispy pita bread, raw vegetables or tortillas chips. 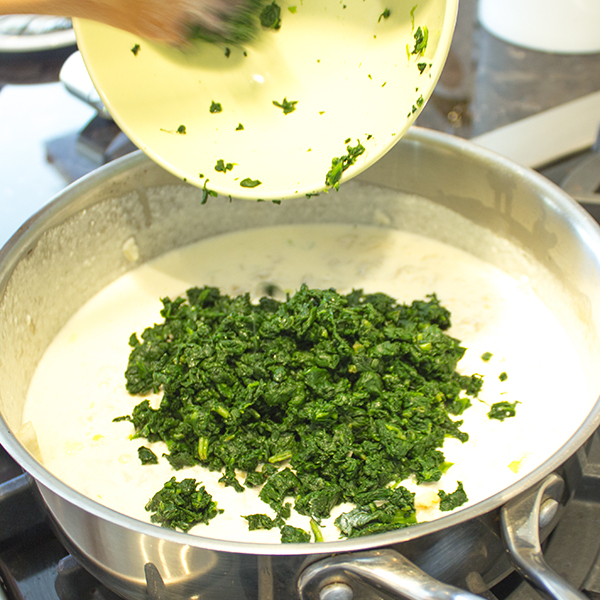 1 - Clean spinach and place in a big pan over medium heat. 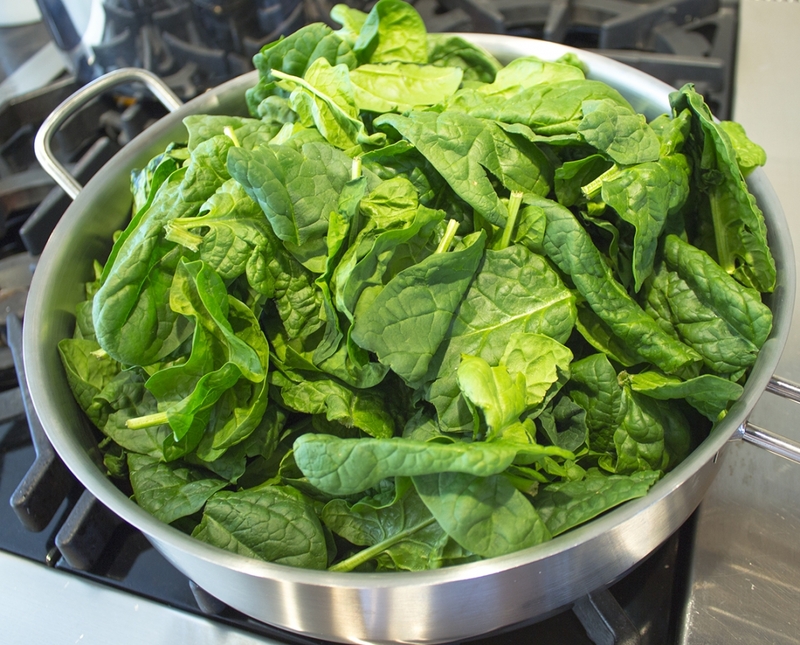 2 - Cook spinach until wilted. 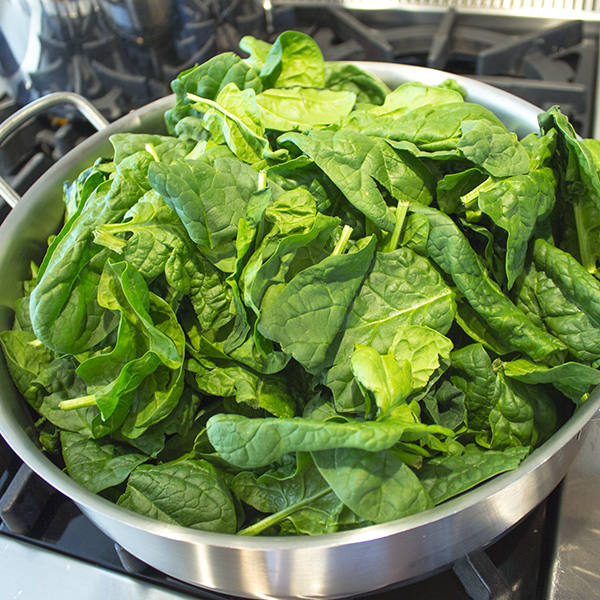 4 - Fold sides of cloth, turn and squeeze over a bowl to remove excess of water from spinach. 5 - Mince spinach ans set aside. 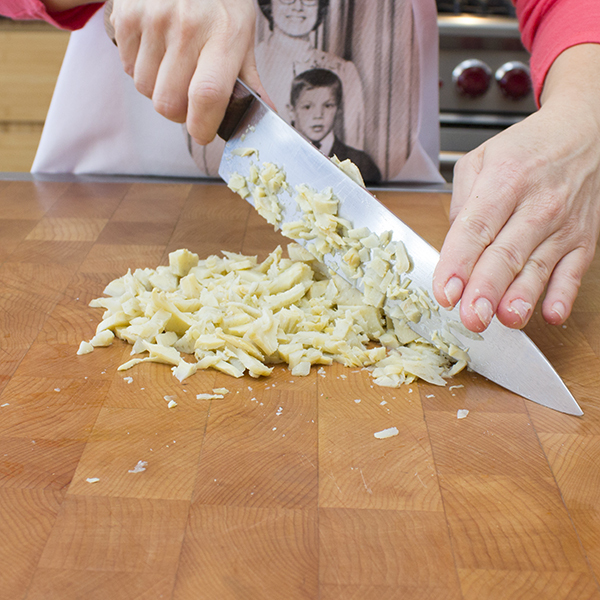 6 - Drain and mince artichokes. 7 - Mince shallot and garlic. 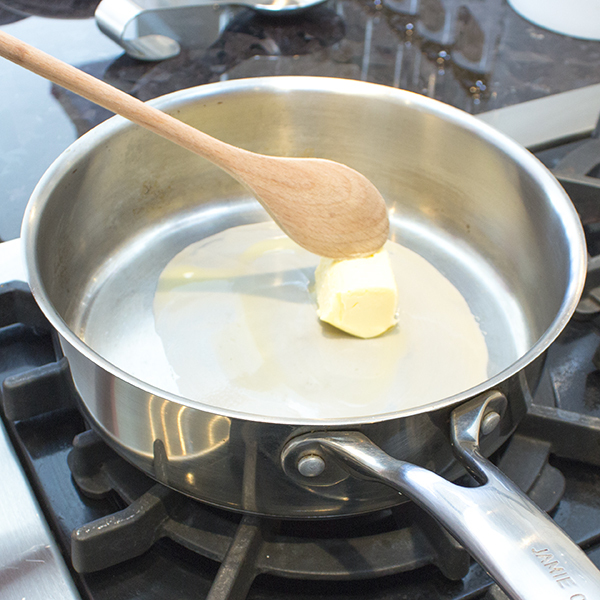 8 - Melt butter in a medium saucepan over medium heat. 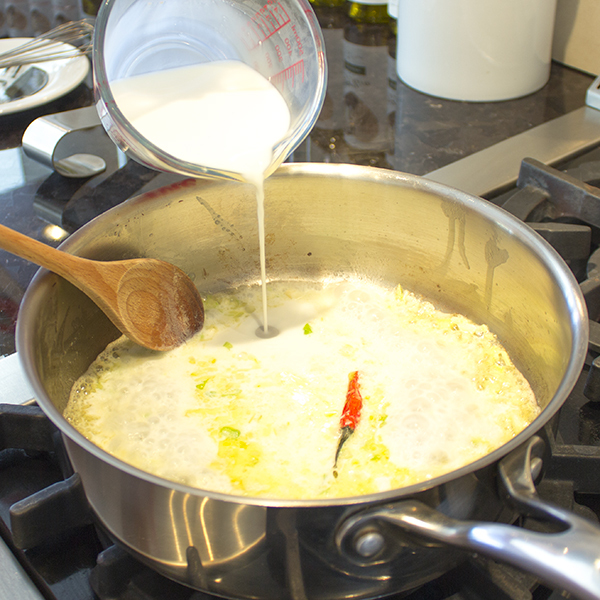 9 - Once it foams, add the shallot, red hot chilli pepper and garlic. Cook until softened, about 2 minutes. 10 - Slowly stir in the milk and mix. 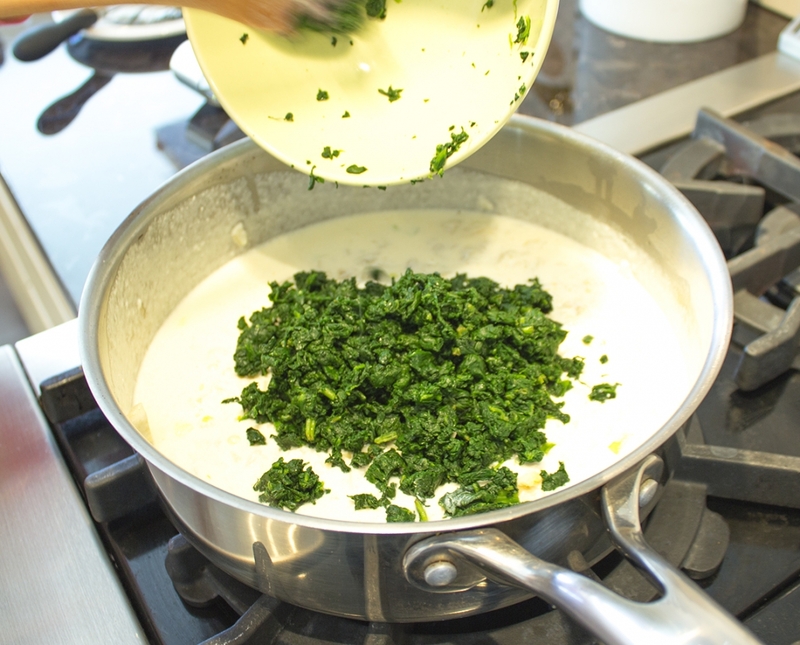 11 - Stir in mascarpone cheese. 12 - Mix until completely melted. 14 - Add spinach and combine. 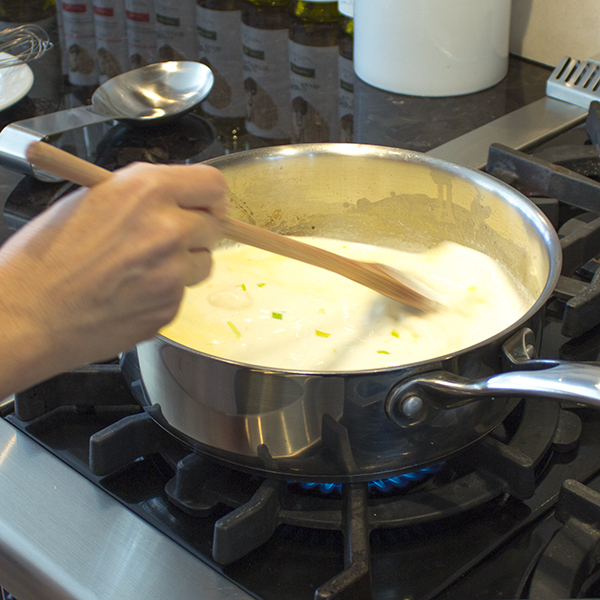 15 - Add cheddar and gruyère cheese and simmer over low heat until completely melted, about 5 minutes. 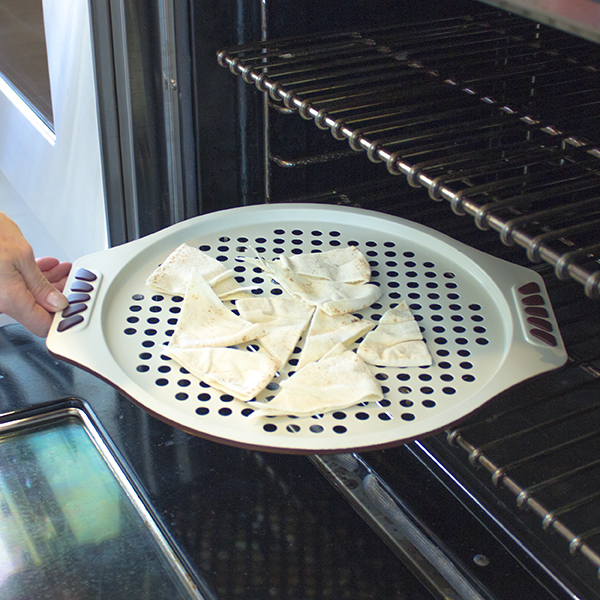 16 - Meanwhile (optionnal), preheat oven to broil and cut your pita bread in small triangles. 17 - Place pita in oven in an oven plate, cook on both sides until golden brown. 18 - Take pita out of oven and drizzle with olive oil, salt and pepper to taste. 19 - When ready, transfer dip in a serving bowl. 20 - Serve with warm and crispy pita bread, raw vegetables or tortillas chips.